On stage or in the streets, the JUNO-Di is a traveling musician’s dream. It’s lightweight, it can run on batteries, and it’s easy to use, yet it performs and sounds like a heavyweight synth. It’s packed with a wide variety of top-quality sounds — over 1,000 to choose from! It has a friendly “direct access” control panel for easy editing and a Song Player for larger-than-life performances. First-timers and pros alike will love this friendly, portable, great-sounding synth. At the heart of this exciting new synth is a top-of-the-line voice engine that delivers world-class sounds — including grand and electric pianos, lush strings, beautiful guitars, powerful brass, percussion, plus banks of exotic instruments, modern synth sounds, and much more. The sound-bank is so diverse, it can compliment any style of music! And if you want to customize the sounds, the dedicated “Sound Modify” knobs on the front panel let you instantly cater each sound to your specifications, even while you’re playing. A software editor is also provided if you prefer more advanced editing via PC. With so many sounds onboard, it could be a daunting task to find what you need. But fear not — the JUNO-Di simplifies the process of finding sounds with its dedicated category buttons. If you want a piano, for example, just press the Piano button. You can even assign your most-used sounds to the Favorite buttons for instant access. Editing is easy too. If you want to create layers or splits, dedicated buttons and the large LCD make the process fast and friendly. And don’t forget the onboard rhythm patterns, which can be easily adjusted on the fly with a dedicated tempo control. It’s a great tool for practice and performance. The JUNO-Di was born to travel. It’s strong yet amazingly lightweight (only 5.2kg) making it easy to lift and carry. The battery compatibility lets you play for up to five hours without plugging in (uses Ni-MH AA-size rechargeable batteries). When used in conjunction with a battery-powered amp such as Roland’s famous CUBE Street or MOBILE CUBE, the JUNO-Di can be played and heard anywhere. A battery-life indicator on the front panel ensures that you won’t lose power unexpectedly. More than meets the eye, the JUNO-Di lets you plug a microphone into its external input and process your voice through the built-in vocoder. A dedicated reverb is assigned to the input, so you can add lush ambience to your voice without taking away from the main onboard effects. Sing along with your performances and transform your voice in colorful and creative ways, from silky smooth to sci-fi robotic. With its USB MEMORY port and Song Player function, the JUNO-Di enables direct playback and control of backing tracks from a USB key. You can play MP3, WAV, AIFF, and SMF files, and control them from the dedicated buttons on the front panel. 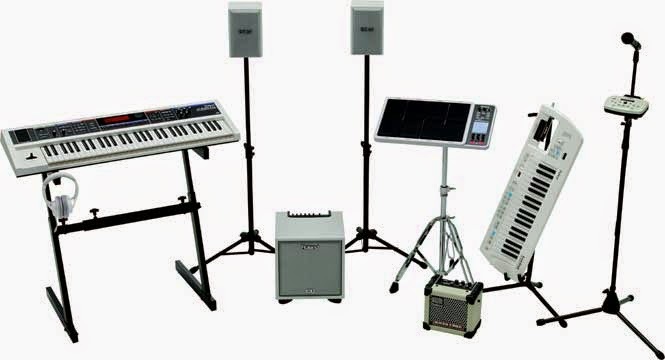 Impress your audiences with full-band performances from a single keyboard! Additionally, the Center Cancel feature lets you sing along karaoke-style with audio files in the Song Player for a complete entertainment experience. You can also connect MP3 players directly to the JUNO-Di through its external input. Rechargeable nickel metal hydride batteries:approximately 5 hours * differs depending on the conditions of use * approximately 4 hours if USB memory is connected * Carbon-zinc or alkaline batteries cannot be used. Microsoft (R) Windows (R) XP Home Edition/Professional Microsoft (R) Windows Vista (R) * This does not work with the 64-bit Edition of Windows (R). * This does not work with the Windows (R) XP Media Center Edition. 512 MB or more * For Mac OS X v10.5 or later, 1GB or more. 5.2 kg11 lbs. 8 oz. * Although Roland has tested numerous configurations, and has determined that on average, a computer system similar to that described above will permit normal operation of the JUNO-Di Applications, Roland cannot guarantee that a given computer can be used satisfactorily with the JUNO-Di Applications based solely on the fact that it meets the above requirements. This is because there are too many other variables that may influence the processing environment, including differences in motherboard design and the particular combination of other devices involved.